On-demand streaming has crept into nearly every media space, and today, OnLive hopes to open the last door and bring high-end games to users, streamed from the cloud. Built on more than 100 patents or patents-pending, OnLive plans to deliver games either to the browser via plug-ins or to the TV through a micro set-top box. 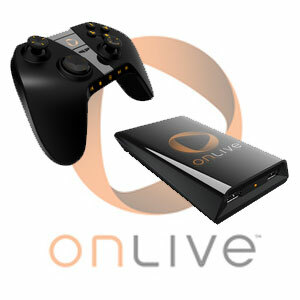 Cloud game service OnLive take the stage to demo its pre-release game-delivery system. 10:16 am: Walt joins Kara onstage to talk about the power of cloud computing and to introduce OnLive. 10:17 am: Steve Perlman, CEO and founder of OnLive, comes on and says in two weeks, users will be able to log on and start cloud gaming. Perlman says gaming is the first offering from OnLive, and that this is the hardest thing to do in the cloud. Walt reminds the audience that Perlman worked on QuickTime at the young Apple Computer (AAPL) and the early Microsoft (MSFT), among others. 10:19 am: Perlman shows the Web interface for playing and watching games. He shows that the games play on the computer, even though the full games would not run on the hardware he’s using if it were local. 10:20 am: Perlman says that as long as you are within 1,000 miles of OnLive’s data center, there is no perceptible latency thanks to new, proprietary compression technology. 10:21 am: Perlman shows how OnLive can create and serve huge volumes of 3-D video “brag clips” just as fast as the games. The whole interface is a movable wall of individual videos. 10:23 am: Now Perlman brings out his “micro-console” to demo on a TV. 10:25 am: Perlman restarts the little black box, which is the size of a large deck of cards. The interface on the TV micro-console is the same as the Web version. Walt asks how many users can be online. Perlman says it is scalable to millions of users. 10:27 am: Walt asks what the price is. Perlman says it will be less than $15 a month, but also hints that access to individual games will add additional costs. 10:28 am: Now Perlman starts an “unauthorized” demo of OnLive on the iPad. No Flash here. He says the interface OnLive designed is also great for the iPad. He sends a message to his “friend” who is playing another game, then begins playing a game called Borderlands on the iPad itself. 10:31 am: Perlman says that the game he’s playing wouldn’t play on any hardware in the room (only very high-end gaming consoles and computers). 10:32 am: Now Perlman opens the version for the iPhone–this one doesn’t work quite right, but Perlman says it’s prototype software and should work because to the iPhone, it’s just streaming media. Walt asks for examples of what else he can deliver besides games. Perlman answers by saying that the data center OnLive will be using may be the largest supercomputer in the world when it turns on in two weeks. He says delivering video would be easy. He says OnLive’s microbox can run software that is too complex to run on any computer currently using Microsoft software. Now he plays a Harry Potter movie on the iPad: No lag in play. 10:37 am: Perlman could keep going, but Walt and Kara bring the demo to a close.